Having issues with your DreamPi? Take a look at the most common problems below and their solutions. My USB modem only has one light (or no lights on certain USB modems). If using wired Ethernet, check to make sure the Ethernet cable is plugged in securely to both the Pi and router. If using Wi-Fi, make sure you have the Wi-Fi settings configured correctly. Keep in mind that the Wi-Fi SSID and password are case sensitive. If using Wi-Fi, make sure you have the latest version of DreamPi. Version 1.4 and earlier has issues with Wi-Fi reliability. You can grab the latest version of DreamPi from the Downloads page. Check to make sure your Pi isn't using the 192.168.X.98 IP address. You can check this by plugging the Pi into a TV or monitor and looking for the line that says "My IP address is"; if you don't see this line, you can log in (username 'pi' and password 'raspberry') and use the 'ifconfig' command to display network info (the IP will be next to "inet addr"). The .98 address is reserved for the Dreamcast so it will cause a conflict if the Pi is using this address. To correct this issue, you'll need to set a static IP address on your Pi. Click here for instructions. Check to make sure your USB modem is compatible with Linux. The Dell NW147 (Conexant RD02-D400) is the recommended modem for DreamPi as it will work out-of-the-box with no driver installation required. 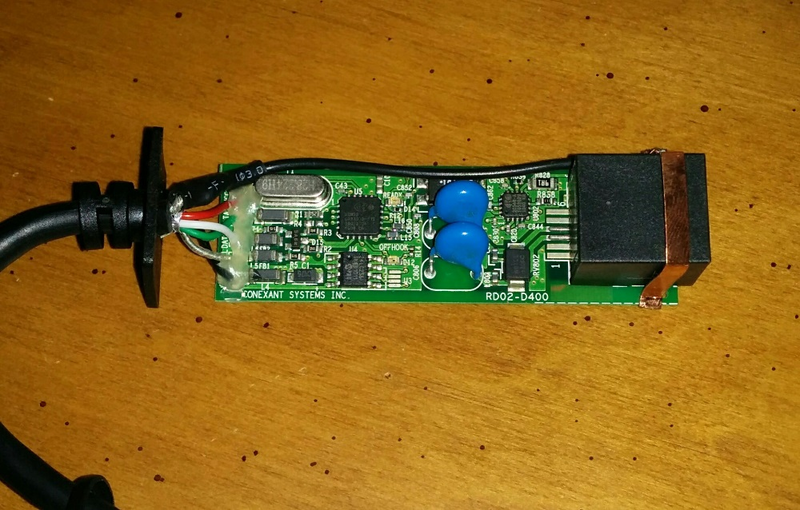 If using a Dell or Lenovo USB modem, check to make sure it isn't a bootleg. You can do this by removing the two small Phillips screws at the bottom of the modem and opening it. Make sure the circuit board matches this picture. If your modem doesn't match this picture, then it's a fake. Check to make sure your router isn't blocking communication to the Pi. You can do this by going to your router configuration page and checking the firewall settings. You can confirm the issue by turning off the firewall. Check to make sure the power light on your Pi is solid red. If it isn't then it may not be getting enough power. Make sure the power adapter is providing 5v and at least 1A (1000Ma) of current. Check to make sure DreamPi is booting up properly by plugging the Pi into a TV. If you see errors that contain "EXT4-fs" or "Unable to mount root fs" then the DreamPi image is corrupted. Try re-flashing the latest DreamPi image to the card by following the instructions in this video (2:04 mark). If you still see the errors, the card may be bad and need to be replaced. When I try and dial a connection on my Dreamcast, it says "No dial tone" or "No answer". This means DreamPi isn't answering the call from the Dreamcast for some reason. Make sure both lights on your USB modem are lit up, indicating DreamPi is ready to accept a connection. If they aren't, see the above troubleshooting steps. Check to make sure your line voltage inducer is working properly. You can do this with a multimeter by setting it to 20v DC and touching one probe to the red wire contact at each end of the phone cable; you should get 9v or more (18v if using a PAL Dreamcast modem). If using a modem with an integrated line voltage inducer, try using a different phone cable. A bad phone cable can cause connection issues. Check to make sure your Dreamcast modem port is free of dust and debris. Try using a can of compressed air to clean it out. You can also remove the modem from the Dreamcast and clean the internal connectors as well. If all else fails, your Dreamcast modem could be broken and needs to be replaced. I have issues connecting to game servers or have frequent connection issues. This could indicate a problem with your line voltage inducer, phone cable, Dreamcast modem, or the Pi itself. It could also be an internet connection related issue. If using a USB modem with an integrated line voltage inducer, try using a different phone cable. A bad phone cable can cause connection issues. Check to make sure the power light on your Pi is solid red. If it isn't then it may not be getting enough power. This could lead to erratic connection issues. Make sure the power adapter is providing 5v and at least 1A (1000Ma) of current. If using Wi-Fi, try switching to a wired connection to see if things improve. If you have a weak Wi-Fi signal where the Pi is being used, it can cause issues. My Dreamcast Now username isn't being accepted. If you input your desired username and it doesn't change after hitting the "Update Profile" button then the username has already been taken. If you're switching connection methods (from Wi-Fi to Ethernet or vise versa) then your username is already being used on the other connection method. Your Dreamcast Now username is associated with the MAC address of the connection method, so Ethernet and Wi-Fi have separate profiles associated with them. If you want to use the same username on a different connection method then you'll need to change the username for the original connection method first. Alternatively you can just add something like "(Wi-Fi)" after the username. Having trouble with a specific game? See the most common issues and solutions below. The game goes back to the main menu shortly after selecting 'Online'. If you used Dreamkey 3.0 to configure your Dreamcast, Alien Front Online won't detect the ISP settings. Use a copy of PlanetWeb or 4x4 Evolution to configure the Dreamcast and try again. My Dreamcast resets when I try and connect. Alien Front Online requires a standard length phone number in order to connect. If you have something like 555 set as your phone number on the Dreamcast, AFO will refuse to connect. Set the number to something like 111-1111. I'm getting the 'Can't Find Server' error. Make sure you have the latest version of DreamPi. Version 1.5 adds a patch for AFO that redirects it to the private server. You can grab the latest version of DreamPi from the Downloads page. The game won't accept my username and password. The username and password are bound to one particular Dreamcast. If you're trying to connect on another Dreamcast, you'll need to make a new username and password. If you need to reset your password, please contact Shuouma. I can't send or receive game invites. The NBA/NFL/NCAA games require you to be running DreamPi 1.7 or later to send game invites. You can receive invites if the other player has 1.7 but you will not be able to send them. You can find the latest version of DreamPi on the Downloads page. If you need instructions on how to install it, see the 2:04 mark in the video here. I'm experiencing a lot of lag in the game. This is fairly normal with Ooga Booga. It's a lot more susceptible to lag than most games due to the way it handles it (pausing the game until all players are synced up). To reduce lag, try finding players from the same country to play with. If using Wi-Fi, you can also try switching to a wired connection; this won't always help but it may if you have a weak signal or a bad connection in the first place. I made an account and got a random username or my username changed. You are always given a randomly generated username when you play for the first time. You may also be assigned a new username if your public IP address changes. To change your username, go here, type in your desired username, and hit 'Change'. The game won't accept my password when creating an account. You must use "pass" as the password when creating an account. I get the "Invalid Configuration" error when trying to connect with a broadband adapter. This is because you have DHCP selected on the LAN Settings page. Make sure you select the "Static IP" tab and use 46.101.91.123 as your DNS server. The game freezes or gives an error when trying to connect. The North American version of Phantasy Star Online v2 requires the Sylverant PSO Patcher to connect. You can download the patcher from the Downloads page. The game is asking for a serial and key. Where do I find these? The serial number and key are located on the inside of the case behind the disc. If you are playing with a burned copy of the game, I recommend purchasing a legit copy to get a unique serial and key. While you can use a shared serial and key that you find online, this will prevent you from registering on the Sylverant website, using some of the server features such as automatic character backup, and participating in server events. I get instantly disconnected when joining a lobby or game with other players. You may need to change the MTU (Maximum Transmission Size) on your router. This setting is usually found in the "Setup" or "WAN Setup" section of your router's configuration page. 1400 is the recommended size for PSO. Make sure you have the latest version of DreamPi. Version 1.5 fixed voice chat in these games. You can grab the latest version of DreamPi from the Downloads page. Worms World Party requires properly set up DMZ or port forwarding for all players joining a game or it won't start. See the bottom of the Connection Guide page for info on how to set up DMZ or port forwarding. A workaround if you know which player is having an issue is to have them host the game. The host does not need DMZ/PF in order to play. If you're able to connect but can't start a game, the problem is likely that you don't have port forwarding or DMZ set up on your router; this is required for many of the online games. Certain games such as Worms World Party require everyone but the host to have DMZ or port forwarding enabled or the game won't start for anyone. See the Connection Guide for a list of games that require it and information on how to set it up. I can't connect with Starlancer, PBA Tour Bowling 2001, or The Next Tetris. Make sure you have the latest version of DreamPi. Version 1.6 includes a fix for certain ISPs that block packets used by these games. You can grab the latest version of DreamPi from the Downloads page. The Game I'm Playing Isn't Showing on Dreamcast Now. Set your DNS on the Dreamcast to 0.0.0.0 and this should solve the issue. Don't see your issue listed here? Make a post in the Online section of the Dreamcast-Talk forum to get help.